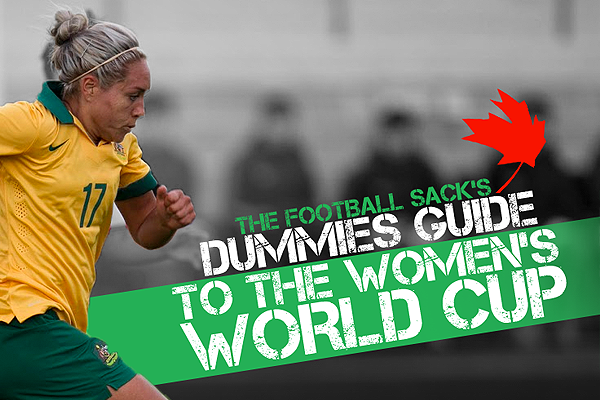 Welcome to The Football Sack’s Dummies Guide to the Women’s World Cup where you can catch-up on everything you need to know in time for kick-off on Sunday! Come back every day this week for the next chapter of the Dummies Guide. After 61 years of men’s tournaments showcasing the world game at its zenith the women’s game was finally given a platform to show its fantastic talent in 1991. The first tournament was conceived by FIFA president Joao Havelange and was held in China. Australia’s organized women’s presence in football had commenced in 1974 with a representative team placing third in 1975’s inaugural Asian Championship. Australia began to play certified internationals in 1978 and entered the qualification process for the sole worldwide women’s tournament in 1991, as women’s football was not added to the Olympics until 1996. Oceania (OFC) got one spot. The final format was a three-team tournament playing each team twice in Sydney in May 1991 between Australia, the old enemy New Zealand and Papua New Guinea. After a 1-0 win and a 1-0 loss against New Zealand, the first-past-the-post qualifier was who could put the cannon fodder, Papua New Guinea to the sword by the most. Australia’s modest attempt culminated in a goal difference of plus 20 after 12-0 and 8-0 victories. Unfortunately we were not to attend the inaugural dance as our Kiwi sisters knocked 16 and 11 past our northern neighbours without reply to send them to China for the tournament. Oops. We did not. Fortunately for us neither did New Zealand, going down 3-0, 4-0 and 4-1 against Denmark, Norway and host China PR respectively. OFC got one spot. The qualifying format remained the same: a three-team tournament playing each team twice, this time in Papua New Guinea. Once again we could not be separated from New Zealand after a 2-1 loss and a 1-0 win. This time the girls took it out on poor old Papua New Guinea, blistering past them 7-0 and 4-0 which fortunately eclipsed New Zealand’s 2-0 and 6-0. We were off to the World Cup! Definitely a learning curve against tough opposition. We bowed out fourth in our group in the first stage recording a 5-0 defeat to Denmark, a 4-2 defeat to China and a 4-1 defeat to the United States of America. Angela Iannotta wrote her place into the history books with the first Australian World Cup goal against China. OFC got one spot for the winner of the six-team 1998 OFC Women’s Championship held in New Zealand. After beginning the tradition of our national teams spanking American Samoa – the Matildas held back, only winning by 21-0 – and following it up with an 8-0 triumph against Papua New Guinea and a 17-0 semi-final win over Fiji; it was head-to-head with New Zealand again. A 3-1 win, this time on their home patch, excellent. Still a work in progress for the Matildas. Despite a marked improvement in performance from the previous tournament the team finished third in the group with a 1-1 draw v Ghana before 3-1 defeats to Sweden and eventual runner-up China sent us home. This tournament sparked unprecedented interest in the women’s game, particularly in the western world as record attendances, including 90,185 for the final at the Rose Bowl, Pasadena, and media coverage met the event. OFC got one spot for the winner of the five-team 2003 OFC Women’s Championship held in Canberra, Australia. After treating Samoa, Cook Islands and Papua New Guinea with contempt, posting 19-0, 11-0 and 13-0 wins respectively, we came into the decider against New Zealand needing a point to qualify. Why not just knock them off instead? A 2-0 win sent the Kiwis home and the Matildas to America. Another unfortunate campaign had us languishing at the bottom of Group D after 2-1 losses to Ghana and Russia and a solitary point versus China with a 1-1 result. Australia’s path to the World Cup now followed the Asian Football Confederation (AFC) tournament. The AFC got three and a half spots (including host China) decided by the 2006 AFC Women’s Asian Cup to be hosted by us. We qualified due to making the final which we lost 4-2 on penalties after a 2-2 draw with China at Hindmarsh Stadium, Adelaide. Got through Group C as runners-up to Norway after a 4-1 win over Ghana (third time lucky! ), a 1-1 draw with Norway and a 2-2 draw with Canada. The Matildas lost the quarter final to eventual runner-up Brazil 3-2. Lisa De Vanna was named as a forward in the All-Star Team. AFC got three spots decided by the 2010 AFC Women’s Asian Cup, which we won 5-4 on penalties after a 1-1 draw with North Korea in Chengdu, China. Got through as runners-up to Brazil in Group D, having lost 1-0 to them before backs-against-the-wall wins over Equatorial Guinea (3-2) and Norway 2-1. Eventual third-place winners Sweden beat us 3-1 in the quarter final in Augsburg. Caitlin Foord was named Best Young Player for the tournament while Elise Kellond-Knight was named as a defender in the All-Star team. After getting past the United States, Nigeria and Sweden in the group WE ARE GOING TO WIN THE WHOLE THING*. From humble beginnings in the late 1970’s, the women’s game in Australia has built from strength to strength. We sit with a developing league among the top women’s competitions in the world and have developed elite structures to foster quality players coupled with a desire and direction to invest, expand and improve these areas. With this in mind, the Matildas and our footballing community that follows them have great cause to be optimistic that the day the green and gold lift the highest honour in football, the Women’s World Cup, might just be around the corner. The future is bright. Good luck, Matildas – Australia is behind you! Is superstar Sam Kerr the best Matildas captain yet?